For a list of all provinces, see List of provinces. In Europa Universalis IV, the world is divided into continents, regions, countries, and provinces. Provinces are the smallest of these divisions. They contribute to a nation's tax, manpower, unrest, overextension, and trade. Each province comprises a small geographic region, with a town or city at its center. Cities currently have no functionality outside of aesthetics, but like provinces, can be renamed as of patch 1.4. Both province and city names can be changed by left clicking on them in the province tab. With the Wealth of Nations expansion, province names can also be dynamic and scripted to be unique for either the province owner, the province culture or the province culture group (in that priority). Since the Common Sense expansion, a province can be improved with development. As of patch 1.28, you can develop provinces without needing Common Sense. There are 3633 provinces in total. Provinces are the heart of any nation in Europa Universalis IV. They provide income, manpower, and trade goods. Introduced in patch 1.12, development is the measure of a province wealth and productivity. The level of development of a province contributes to local trade power, land and naval force limits, supply limit modifier and the total number of buildings that can be built in a province. Development is further divided into base tax, production and manpower. Each can be improved further with the appropriate monarch points. Each province has a base tax, roughly corresponding to the population and wealth of the area. The amount shown is the tax earned each month from that province, after all the modifiers have been accounted for. Prior to patch 1.12, the figure given ingame is the tax obtained annually. Each province produces a specific type of resource or trade good. See Trade for a complete list of trade goods. The figure given ingame is the monthly production income. Production efficiency further increases the income received. Every province contributes a certain amount of manpower to the manpower pool of a nation. This is affected by the province manpower development level, and are modified by ideas, government type and buildings. 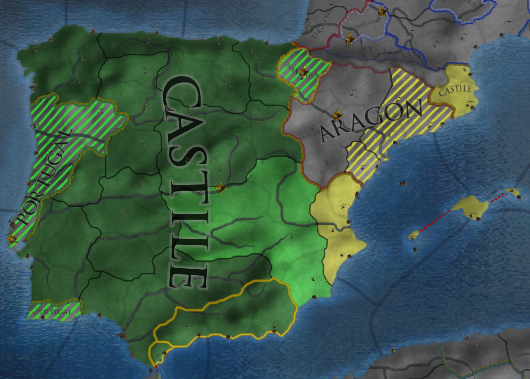 Provinces can be defended by forts. Provinces that lack a fort will fall easily to the enemy. Forts exert a Zone of Control around itself and surrounding provinces, and must be taken before an enemy army may pass through. In times of peace, a fort may be mothballed in order to save maintenance, at the cost of it falling into disrepair and possibly not being able to defend the province. Nations may start off with forts in strategic locations. Capital provinces without a fort starts with a special level 1 fort that does not exert Zone of Control around itself, and has a smaller garrison. Related closely to production is trade. Each province produces a certain amount of trade power and contributes trade value to the trade node it is attached to. Autonomy represents the degree of control the government of the nation exerts over a province. The lower it is, the more control the government has. Autonomy determines how productive a province is to a nation.A province with 100 local autonomy won't pay tax and won't give manpower and trade power. In troubled times, various parties may decide to rebel against the national government. This is represented in-game by unrest. 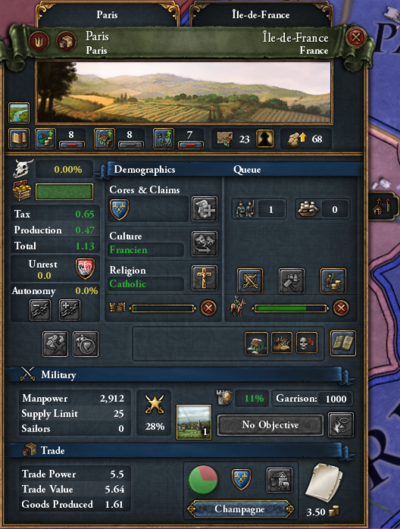 The type of rebels that may appear are shown in the province screen, and also in the stability and expansion government tab. Unrest can also be lowered by increasing the local autonomy, but will decrease the income and manpower that province produces. Developing in a province removes devastation at 5% per point (with adjustment according to local autonomy). Cores represent the parts of the nation that it considers rightfully theirs. Cores belonging to nations that do not exist are greyed out. A province can have an unlimited amount of cores. A nation may claim another province through espionage or boundary disputes. Each province has a primary culture and religion. Provinces that have foreign cultures or do not share the state religion tend to be more rebellious and less productive. Nations may further develop their provinces by building improvements and infrastructure. The number of buildings that can be built in a province are limited by its development level. Every nation in Europa Universalis IV has a capital province. The capital is considered the political center of the nation and should be defended at all costs. Capitals can be moved at the cost of 200 administrative points. Every nation has a main trading port province which is by default located in the same province as the capital. Trade is automatically collected in a nation's main trading port without the need to station a merchant there, and without suffering from the -50% total trade power cut suffered when collecting trade income in another node than the one of the main trading port. Trading ports can be moved at the cost of 200 diplomatic power in order to optimize trade income. Straits are connections between two provinces which do not share a land border but instead can be accessed over a water body. A list of straits in the base map is below. Please help improve this article or section by expanding it with: further information about winters, see the talk page..
Each province has a climate and may experience winters and/or monsoon of varying severity. There are map modes for climate and weather. The arctic climate is harsh, where there is not much large vegetation. The arid climate has a severe lack of rainfall, making it very hard to keep a large army supplied. The tropical climate makes it very hard for new cities to grow, as diseases and heat are large obstacles. There is a small amount of snow on the ground, and the temperature is just below freezing. The ground is covered by snow, and the temperature is solidly below freezing. The snow has piled up quite severely, and the temperatures are far below freezing. Mild seasonla rain is falling, fertilizing the ground but increasing the difficulty of travel. The Monsoon season is in full swing as torrential rain falls from the sky. Extreme wind and rainfall make this province very difficult to traverse. Center of trade is a controllable mechanics now. Center of trade can be upgraded or downgraded manually, but cannot be created or removed. However, some events (like colonial 19) allow a natural harbor growing to center of trade. Manual management can be done in building interface, where center of trade icon occupies 2 building slots. As a result, province with center of trade can only build 10 buildings at most rather than normal 12 buildings. The base cost to upgrade a center of trade from level 1 to level 2 is 200 ducats, and the base cost from level 2 to level 3 is 1000 ducats. Downgrading a center of trade will cost 10 prestige, but this option is available only if country has positive prestige. If a province suffers from change of ownership, no matter by war or by diplomatic actions, the center of trade level will automatically drop by 1 to a minimum of level 1. For a list of all centers of trade, see Economic list of provinces. This province is a natural harbor and a trading hub. Local traders have come here for centuries, the infrastructure of the trade emerging despite a lack of state investment. This province is a major entrepot for trade. Merchants from the entire region gather here to buy and sell goods. This province is one of the major ports of the world. Goods from entire globe regularly pass through here and the city itself is as famous as many kingdoms. This province is a natural spot for trade and local merchants have been coming here for centuries. This city is a major regional market and traders from the entire region regularly seek it out to sell and buy goods. This province is one of the most important trade centers in the world. There are few goods that cannot be bought here and the city itself is as famous as many kingdoms. Controlling the important river estuary strengthens our hold of the trade in the region. The importance of this province as a Religious Center will make it very difficult to convert. Religious centers have −5% local missionary strength. After the the Protestant Reformation, new religious centers will appear for the Protestant, Reformed, and Anglican faiths, depending on where they start. Up to three religious centers will appear for each of the Protestant and Reformed religions, and no more than one for Anglican. States and Territories are a new mechanic introduced in patch 1.16 intended to replace the old Overseas mechanic. The system introduces a 2-part coring process. A newly conquered province is considered as part of a territory (unless it already belongs to one of the nation's existing states). Turning a territory into a state requires firstly coring all the uncored owned provinces in that territory and secondly payment of state maintenance. Afterwards, it is possible to instantaneously complete the coring process by paying the remaining coring costs. Provinces which are not part of a nation's state and cored have 75% Local autonomy floor and therefore regarded the same way as overseas provinces used to beforehand. ↑ See in /Europa Universalis IV/common/static_modifiers/00_static_modifiers.txt (Static modifiers#Arctic). ↑ See in /Europa Universalis IV/common/static_modifiers/00_static_modifiers.txt (Static modifiers#Arid). ↑ See in /Europa Universalis IV/common/static_modifiers/00_static_modifiers.txt (Static modifiers#Tropical). ↑ See in /Europa Universalis IV/common/static_modifiers/00_static_modifiers.txt (Static modifiers#Mild Winter). ↑ See in /Europa Universalis IV/common/static_modifiers/00_static_modifiers.txt (Static modifiers#Normal Winter). ↑ See in /Europa Universalis IV/common/static_modifiers/00_static_modifiers.txt (Static modifiers#Severe Winter). ↑ See in /Europa Universalis IV/common/static_modifiers/00_static_modifiers.txt (Static modifiers#Mild Monsoon). ↑ See in /Europa Universalis IV/common/static_modifiers/00_static_modifiers.txt (Static modifiers#Normal Monsoon). ↑ See in /Europa Universalis IV/common/static_modifiers/00_static_modifiers.txt (Static modifiers#Severe Monsoon).